These are real things I witnessed this week at the swimming pool! Apologies if this offends anyone but this is how I roll. 1. Budgie smugglers, let's be honest, there's not many men who can carry these off, really there were far too many with these on, cover up - purlease! 3. Skimpy bikini's, yes, you have a lovely body but there really is a time and place and a family pool is really not the place for your tiny triangular bikini on your double cup boobies! 4. Hair, please if you are going swimming, have a back, armpit, leg or bikini wax, excess body hair in public is gross. 5. Manky feet, if you have a fungal nail infection, please don't go swimming YUCK! 6. Breast feeding in a very unsupportive bikini, now, I'm all for breast feeding anywhere you like, but I did feel as though it was a bit too personal seeing a woman breastfeed in a bikini - felt like she was in her underwear. 7. Heavy petting, there's a reason the signs have been saying it for years, there's a time and place for this too - get a room! 8. Shorts that could fit your 10 year old, why do some men think that wearing too tight shorts is a good thing? Unless you are David Beckham, please don't! I hope you're still with me and not running for the unfollow button. For those people who are with me, can you add anything to the list? Yea I have to agree with these, budgie smugglers are the worst thing they make me feel so uncomfortable When see old guys parading around in them. Lol I hate budgie smugglers, also I do not get teeny bikinis when you're swimming with your children, all it takes is one of them to grab the wrong thing and oops! At least nothing floated past your nose! 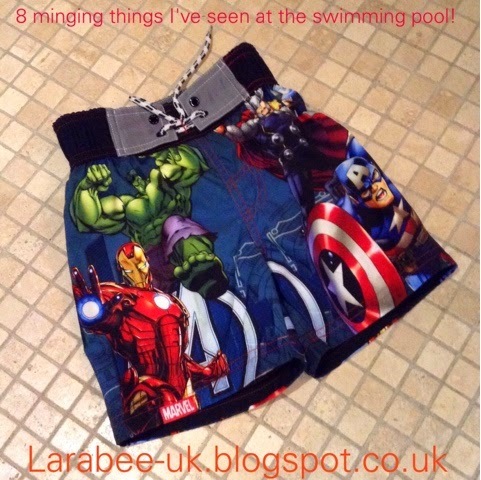 These are eight good resons for me to continue not to go swimming lol! Budgie smuggler!! Why are they even sold? Nobody can rock that look, ever! Ewww!